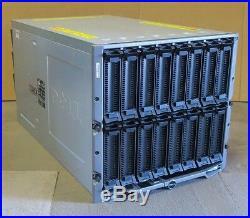 Dell PowerEdge M1000E 16-Slot Blade Server Chassis Enclosure V1.1 6x 2700W PSU’s. In Good Condition, Full Working Order. Midplane Version 1.1. The enhanced midplane 1.1 capabilities are Fabric A – Ethernet 1Gb, 10Gb; Fabrics B&C – Ethernet 1Gb, 10Gb, 40Gb – Fibre Channel 4Gb, 8Gb, 16Gb – IfiniBand DDR, QDR, FDR10, FDR. PLEASE NOTE THAT NO BLADE SERVERS ARE INCLUDED IN THIS SALE. 1 x Dell PowerEdge M1000e 16-Slot Blade Chassis. 2 x CMC Controller Module DP/N: NC5NP. 1 x iKVM Module DP/N: K036D. 6 x 2700W Power Supplies. 9 x 12V High Efficiency Fan Modules. The PowerEdge M1000e blade chassis enclosure is the robust foundation for the PowerEdge M series blade solution, enabling significant data center density with an easy to deploy and manage platform that maximizes power and cooling efficiency. A new era for blade servers. Help reduce the cost and complexity of managing blade resources with the PowerEdge M1000e blade enclosure. Powerful management tools Take charge of your blade environment with the integrated management tools that help make the M1000e one of the most effective blade-server products in the industry. Flexible remote management Tailor your PowerEdge blade management with the Chassis Management Controller to best suit your needs over your entire blade infrastructure, in a single data center or around the world. Outstanding efficiency Help increase capacity, lower operating costs and deliver better performance per watt with the PowerEdge M1000e. Expand your data center with a flexible and scalable system designed to support future generations of blade technologies. Extensive I/O with flexible scalability Meet your growing data center performance demands with the advanced input/output (I/O) functionality and flexible scalability of the PowerEdge M1000e Blade Enclosure. Simplified product integration Limit your downtime with Dell FlexAddress, which can greatly streamline the process of integrating new servers and other components into the enclosure. The new-generation PowerEdge experience. Make IT the engine for your business success. The newest generation PowerEdge family is engineered with the right combination of features and performance scalability to handle tough workloads for both large and small data center environments. Improve operational efficiency with enhanced systems management. Streamline operations and boost productivity to get the most out of every dollar spent. Manage your Dell PowerEdge servers in complex IT environments by automating the most essential server lifecycle management tasks: deploy, update, monitor and maintain. For more information, visit dell. Com/openmanage. Form Factor: 10U modular enclosure holds up to sixteen half-height blade servers 44.0cm(17.3)H x 44.7cm(17.6)W x 75.4cm(29.7)D Weight: Empty Chassis only 98lbs (44.5kg) Chassis w/ all rear modules (IOMs, PSUs, CMCs, KVM) – 176lbs (79.8kg) Max Fully loaded w/ blades and rear modules – 394lbs (178.7kg). We can supply this server with a different specification to suit your requirements; more or less memory, different or additional hard drives, additional network cards etc. VAT IS NOT PAYABLE BY PURCHASERS OUTSIDE THE European Union (EU) AND by purchasers in the EU (excluding UK) who are VAT registered. The item “Dell PowerEdge M1000E 16-Slot Blade Server Chassis Enclosure V1.1 6x 2700W PSU’s” is in sale since Sunday, September 16, 2018. This item is in the category “Computers/Tablets & Networking\Enterprise Networking, Servers\Servers, Clients & Terminals\Computer Servers”. The seller is “itinstock” and is located in North London. This item can be shipped worldwide. This entry was posted in dell and tagged 16-slot, 2700w, blade, chassis, dell, enclosure, m1000e, poweredge, psus, server. Bookmark the permalink.